In our Scamville series of posts last October we exposed the massive user fraud occurring Facebook and MySpace social games. Fake quizzes tied to long term mobile subscriptions, malware-laden toolbar downloads and other scams were the center of the controversy. The industry did a lot of talking in the wake of those posts and some long term changes have been made. For the most part, for example, Fake quizzes and the Video Professor scam are off Facebook (but see below on what’s still there). But now we’re seeing the same old scams hit the iPhone. And the same players, particularly OfferPal Media and SuperRewards and now Google, are powering those scams. Specifically we’re seeing SMS-subscription offers, which trick users into putting long term subscriptions on their mobile phones (or their parent’s mobile phones). 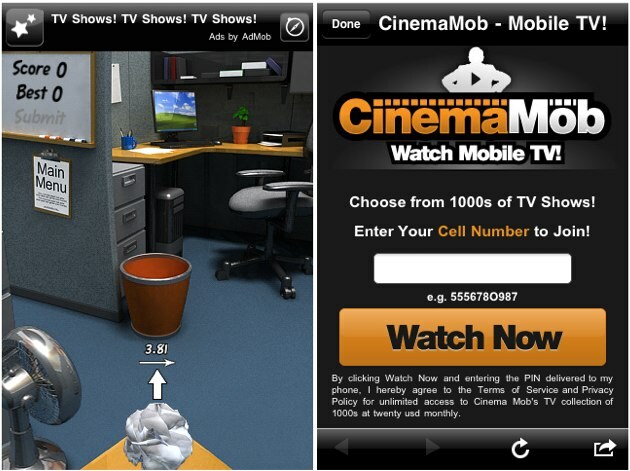 We’ve seen very misleading SMS subscription ads on a variety of applications with Admob ads. We’ve reached out to Google for their comment. We also led the formation of an IAB standards board to set industry guidelines for lead-gen offers on social networks, and Offerpal is the ONLY offer-network who is participating in this effort. So the issue of offer quality on social networks has been properly addressed and is considered by the industry to be an issue of the past. 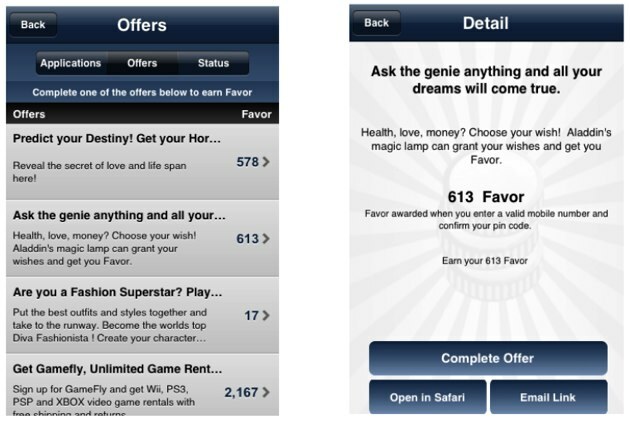 Recently, we have begun to test offers in a few mobile games and apps, in particular on the iPhone. Offerpal has been participating in this effort at the request of a couple of iPhone developers and we have also just opened a direct dialogue with Apple to jointly establish standards and guidelines for offers in iPhone apps before any general rollout. In the meantime, we have been applying the same quidelines that we have been successfully using in Social Games to the few mobile apps that are carrying offers. However the vast majority of the “offers” that are running in iPhone apps are simply installs of other iPhone apps, as can be seen for example in “Tap Tap Revenge 3”. However, Mike has raised the question of whether mobile quizzes and other apps resulting in PSMS subscriptions may still not be clear enough in citing their terms since users may not realize they are opting in for an ongoing PSMS subscription. Although such quizzes and PSMS offers are currently in wide distribution by most of the major mobile ad networks, Mike raises a valid question. So in the interest of being conservative and wanting to operate in the best interests of the collective mobile user experience, we have immediately removed the quizzes in question and any offers resulting in PSMS subscriptions from distribution pending a further review of the concerns Mike has raised. Over the next week or so we will accumulate as much feedback as we can from developers, publishers, mobile platforms, and others in the industry, and on Monday March 22 we will publish on our website and via a press release a written statement of our guidelines and policies regarding alt-pay offers in mobile apps. These types of offers are particularly insidious. 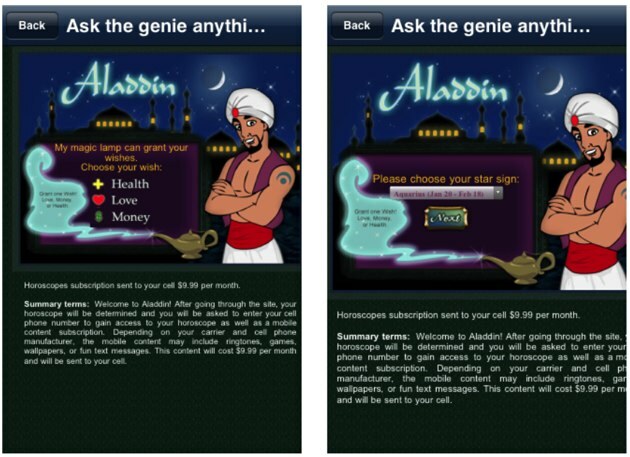 Users are offered virtual currency in exchange for answering a quiz or some other seemingly harmless offer. But once they click through and awswer the quiz questions they’re told they need to enter their mobile phone number to get quiz results. Often there is fine print outlining the charges. But the already tiny print is completely unreadable on a mobile screen, making that disclosure meaningless even when it appears. SMS subscription scams are among the most lucrative offers to game publishers because users get a recurring fee of $10 – $25 per month until they are able to terminate the subscription. Many users never notice them, and those that do usually have a lot of trouble getting them shut off. We’ve also seen offers for the Zwinky toolbar back on Facebook games. When Zynga CEO Mark Pincus said “I did every horrible thing in the book to, just to get revenues right away” he was talking about Zwinky, one of the most hated malware wrappers on the Internet. Too see it back on Facebook offers, through both Offerpal and SuperRewards (we saw offers from both companies on Fishworld by TallTreeGames) is disconcerting.